Disney is thrilled to provide young Latinas with the opportunity to celebrate the elegance, grace and poise of their favorite Disney Princess characters on such a special and momentous day. I’m not sure how much grace and/or poise you can display strutting around in these things; but then again, I am a little past my quinceañera, and for sure cannot afford these graceful dresses, which range between $530-$999. I guess I’ll have to find a way to display elegance, grace and poise in jeans and a pair of huaraches. This entry was posted in Fashion, Marketing & Advertising, Stupid propositions and tagged Disney, Disney Royal Ball, Quinceañeras. Bookmark the permalink. Jeeeeezzzz! The bodice isn’t too offensive, but the lower part looks like a 70s sofa’s nether regions! you have to be mexican to understand. 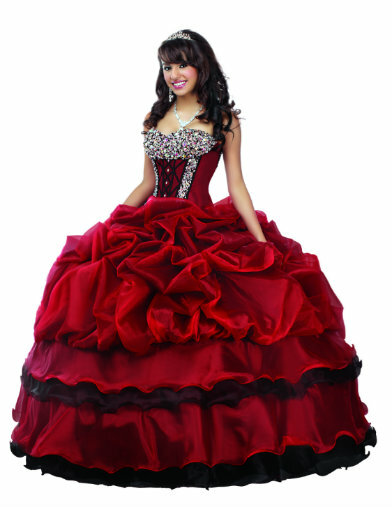 Quinceañera dresses are supposed to be big and reaching that age is a big deal in the culture. These dresses are perfectly fine, and you obviously do not know what parents tend to spend in such a party.